COMMENTS:        This trigger occurred at longitude,latitude = 198.17,-9.02 [deg]. MASTER-OAFA robotic telescope (MASTER-Net: http://observ.pereplet.ru) located in OAFA was starting inspection of the FERMI trigger 508295323 (GRB170209.05) error-box (ra=07h 33m 36s dec=-49d 38' 23" r=3.22 https://gcn.gsfc.nasa.gov/other/508295323.fermi GRB_TIME: 2017-02-09 01:08:38.08UT) 112 sec after trigger time at 2017-02-09 01:10:30 UT. The 5-sigma upper limit on our 60s exposure set is 18.6 mag . During Fermi 508295323 trigger ( https://gcn.gsfc.nasa.gov/other/508295323.fermi GRB_TIME: 2017-02-09 01:08:38.08UT) inspection MASTER-OAFA auto-detection system discovered new OT source at (RA, Dec) = 07h 23m 07.30s -52d 14m 46.6s on 2017-02-09 02:07:07.478UT with unfiltered m_OT=17.4 (mlimit=18.1m). The second image is on 02:14:07.83 UT with m_OT=17.4. There are only 2 inspection images of this area, the GRB_ERROR was 3.22 deg radius, and we cover full field in inspection mode by 2 images. There is no minor planet at this place. There is no any sources in VIZIER database, it means 22mag upper limit in POSS (Palomar) images. We have reference image without OT on 2017-01-29.17249 UT with 19.6 unfiltered magnitude limit. MASTER-SAAO reobserved it on 2017-02-09 18:37:14UT (sunset in SAAO, Sun altitude is -12.0). There is no OT brighter 18.7m. Deep photometry and spectral observations are required. The detection made on zenit distance = 76 degrees, galaxy latitude b = -83 degree. The sun altitude was -24 degree. The moon ( 0 % bright part) was below the horizon (the altitude of the Moon is -14 degree ). with an uncertainty of 3.22 degrees (radius, 1-sigma containment, statistical only; there is additionally a systematic error which we have characterized as a core-plus-tail model, with 90% of GRBs having a 3.7 deg. error and a small tail suffering a larger than 10 deg. systematic error [Connaughton et al. 2015, ApJS, 216, 32]). The angle from the Fermi LAT boresight at the GBM trigger time is 120 degrees. The GBM light curve consists of a long GRB with two bright episodes of emission over a duration (T90) of about 40 s (50-300 keV). The time-averaged spectrum from T0+0 s to T0+40.0 s is best fit by a power law function with an exponential high-energy cutoff. The power law index is -0.95 +/- 0.07 and the cutoff energy, parameterized as Epeak is 132 +/- 9 keV. The event fluence (10-1000 keV) in this time interval is (9.34 +/- 0.37)E-06 erg/cm^2. The 1-sec peak photon flux measured starting from T0+1.9 s in the 10-1000 keV band is 12.6 +/- 0.4 ph/s/cm^2. The long-duration GRB 170209A (Fermi GBM Detection: Roberts & Meegan, GCN Circ. 20652) has been detected by Fermi (GBM), Konus-Wind, INTEGRAL (SPI-ACS), and Mars-Odyssey (HEND), so far, at about 4118 s UT (01:08:38). The error box area is 1.66 sq. deg, and its maximum dimension is 7.64 deg (the minimum one is 13.1 arcmin). The Sun distance was 105 deg. The distance between the narrowest annulus (GBM-HEND annulus with 3 sigma half width of 0.109 deg) center line and the optical transient J072307.30-521446.6 (Podesta et al., GCN Circ. 20650) is 1 arcmin, supporting the association of the transient and the GRB. Any uncatalogued X-ray sources detected in this analysis will be reported on this website and via GCN COUNTERPART notices. These are not necessarily related to the IPN event. Any X-ray source considered to be a probable afterglow candidate will be reported via a GCN Circular after manual consideration. The long-duration GRB 170209A (Fermi-GBM detection: Roberts and Meegan, GCN Circ. 20652; IPN triangulation: Hurley et al., GCN Circ. 20656) triggered Konus-Wind at T0=4120.061 s UT (01:08:40.061). The burst light curve shows two multipeaked episodes started at ~T0-2 s with a total duration of ~40 s. The emission is seen up to ~1 MeV. As observed by Konus-Wind, the burst had a fluence of 8.35(-0.69,+0.76)x10^-6 erg/cm2, and a 64-ms peak flux, measured from T0+1.904 s, of 2.75(-0.80,+0.84)x10^-6 erg/cm2/s (both in the 20 keV - 10 MeV energy range). The time-averaged spectrum of the burst (measured from T0 to T0+41.216 s) is best fit in the 20 keV - 2 MeV range by a power law with exponential cutoff model: dN/dE ~ (E^alpha)*exp(-E*(2+alpha)/Ep) with alpha = -0.59(-0.30,+0.35) and Ep = 126(-13,+18) keV (chi2 = 68/60 dof). Fitting by a GRB (Band) model yields the same alpha and Ep, and an upper limit on the high energy photon index: beta < -2.6 (chi2 = 68/59 dof). The spectrum near the maximum count rate (measured from T0+0.256 to T0+8.448 s) is best fit in the 20 keV - 2 MeV range by a power law with exponential cutoff model: with alpha = -0.92(-0.31,+0.35) and Ep = 164(-28,+47) keV (chi2 = 60/60 dof). Fitting by a GRB (Band) model yields the same alpha and Ep, and an upper limit on the high energy photon index: beta < -2.2 (chi2 = 60/59 dof). Swift-XRT has performed follow-up observations of the IPN-detected burst GRB 170209A (Roberts et al. GCN Circ. 20652), collecting 5.0 ks of Photon Counting (PC) mode data between T0+134.5 ks and T0+153.7 ks. No X-ray sources have been detected consistent with being within 16 arcsec of the MASTER-OAFA position. The 3-sigma upper limit in the field ranges from ~0.002 to ~0.005 ct s^-1, corresponding to a 0.3-10 keV observed flux of 8.6e-14 to 2.0e-13 erg cm^-2 s^-1 (assuming a typical GRB spectrum). The results of the XRT-team automatic analysis of the XRT observations, including a position-specific upper limit calculator, are available at http://www.swift.ac.uk/ToO_GRBs/00020739. 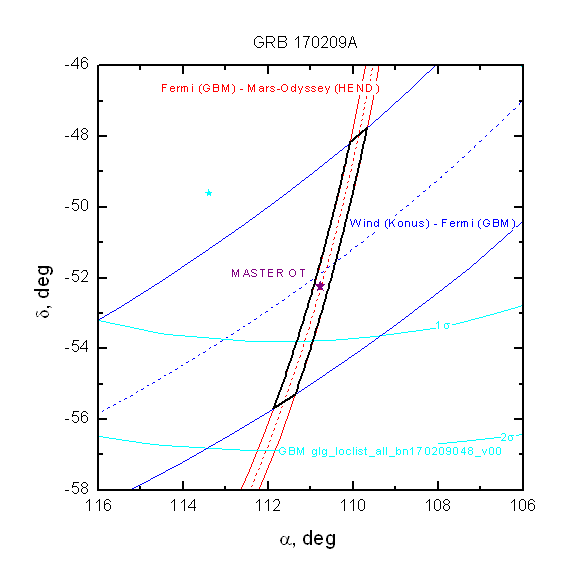 Analysis of AstroSat CZTI data showed a clear detection of GRB 170209A (Fermi GBM detection: O.J. Roberts et al., GCN Circ. 20652) in the 40-200 keV energy range. The light curve showed multiple peaks emission. The first emission peak occurred at 01:08:40.08 UT, 2 s after the Fermi trigger and a second group of emission peaked at ~34 s after the trigger. An interval of ~9 s between these two showed no detectable emission. The measured peak count rate was 245.1 counts/s above the background in combined data of four quadrants, with a total 1453.0 counts. The local mean background count rate was 343.9 counts/s. Using cumulative rates, we measured a T90 of 40.4 s.
We observed the field of the optical transient reported by MASTER (Podesta et al. 2017, GCN #20650) of GRB 170209A (Fermi/GBM trigger 508295323; Roberts & Meegan 2017, GCN #20652) simultaneously in g'r'i'z'JHK with GROND (Greiner et al. 2008, PASP 120, 405) mounted at the 2.2 m MPG telescope at ESO La Silla Observatory (Chile). Observations started at 03:16 UT on 2017-02-10, 26 hrs after the GRB trigger, resulting in 36 min of total exposures in g'r'i'z' and 30 min in JHK. They were performed at an average seeing of 2.3" and at an airmass of 1.1. A second epoch observation was started at 03:03 UT on 2017-02-15, around 6 days after the GRB trigger, resulting in 72 min of total exposures in g'r'i'z' and 60 min in JHK. Seeing conditions were better, around 1.3". We detect two sources close to the MASTER position: the fainter one, to the North-West, has faded by more than 1.2 mag, while the second source (to the South-West) stayed constant within the errors. with an error of +-0.3", and about 1.5 arcsec from the MASTER position. The close match with the MASTER object, the fading and the powerlaw-like r'i'z colors confirm the nature of this object as the afterglow of GRB 170209A, as suggested also by Hurley et al. 2017, GCN #20656 based purely on the positional coincidence. Given magnitudes are calibrated against GROND zeropoints and 2MASS field stars and are not corrected for the Galactic foreground extinction corresponding to a reddening of E(B-V)= 0.12 mag in the direction of the burst (Schlafly & Finkbeiner 2011). We thank the support astronomer, S. Ciceri, for the support of the observations.